At Raahavegaard we have been engaged in agriculture since 1988 and in 1992 we commenced exportation of Christmas trees to Europe. We have obtained a thorough knowledge of the market focussing on the individual demands and needs of the European customers – all considering the possibilities of this natural product. Being a privately owned company, we offer personal service in our effort to meet the specific demands of our customers. Delivery of fresh trees, the specific mix of qualities as agreed and punctual delivery make up the target for any successful business. Raahavegaard has previously been an arable farm with production of cereals, suger beet, grass seed and some speciality crops. Today our main production is Original Nordmann Christmas trees for export. 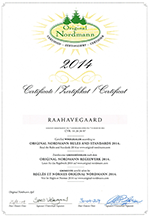 Raahavegaard is Certified Original Nordmann manufacturer and exporter since 2010. Our production of Christmas trees is also Global G.A.P. certified since 2013.